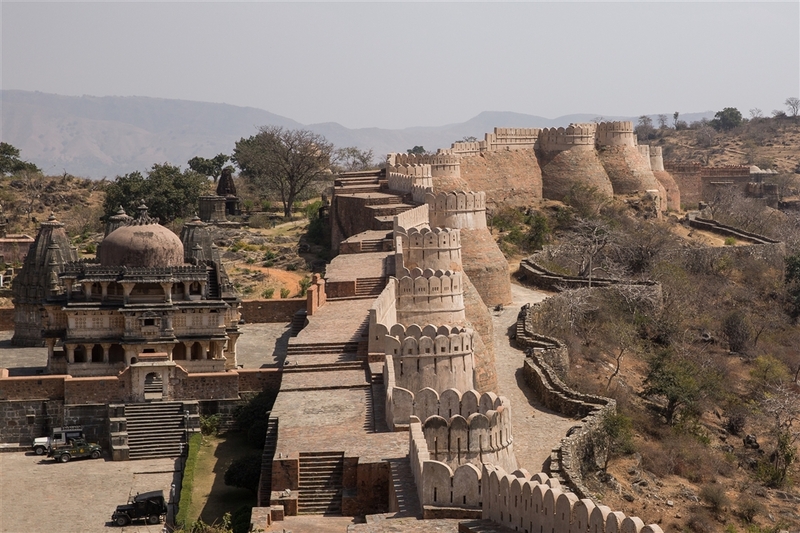 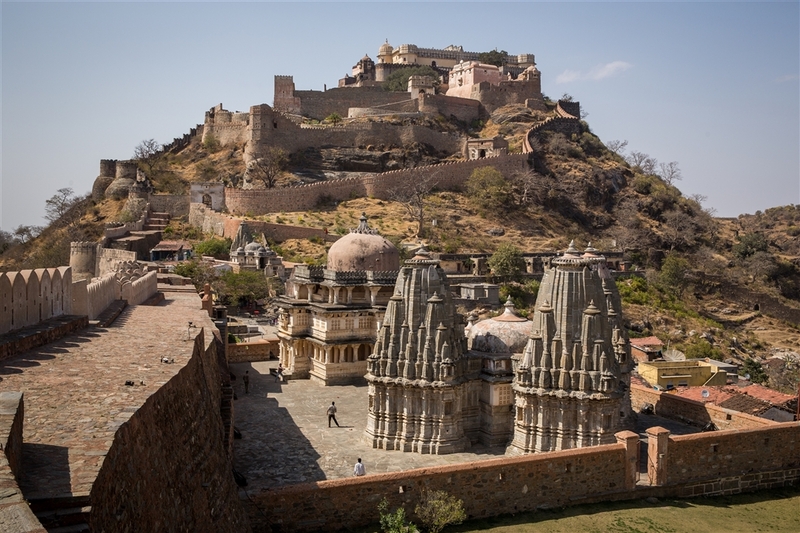 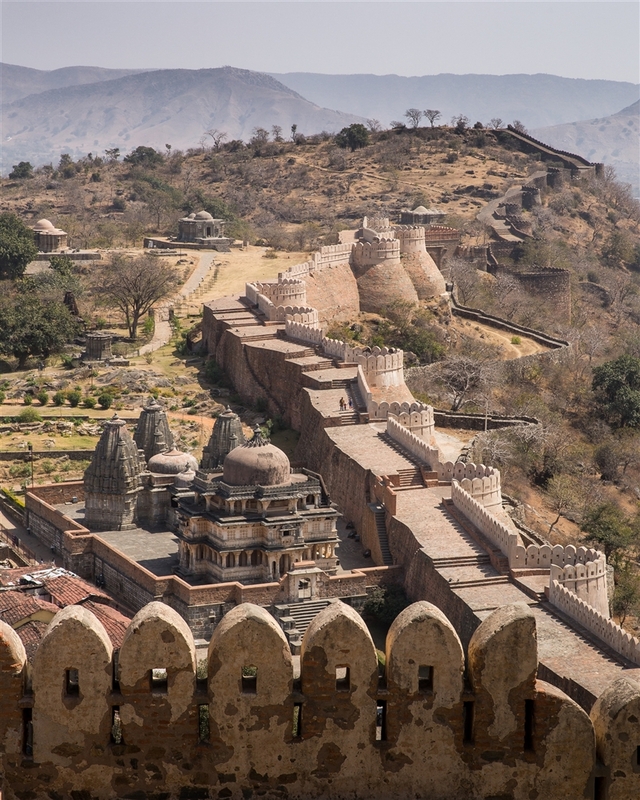 Kumbhalgarh Fort is one India’s finest hill forts, set on one of the highest peaks of the Aravalli Hills, 65m north of Udaipur. 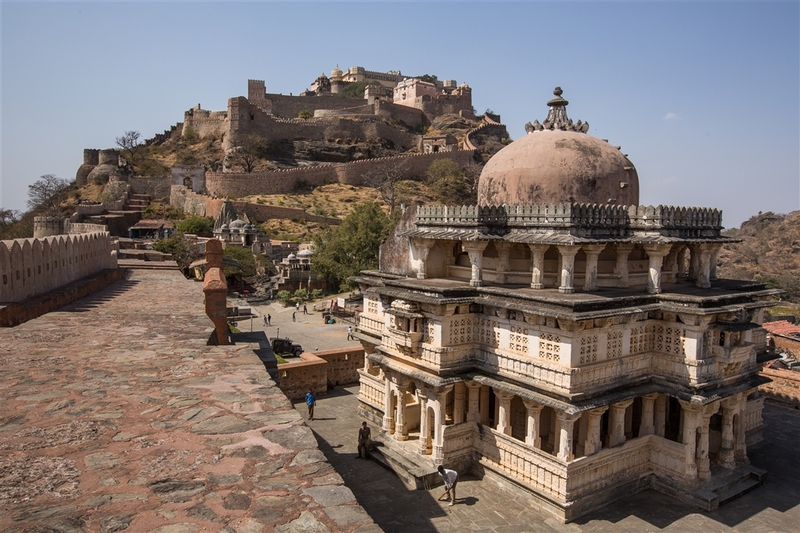 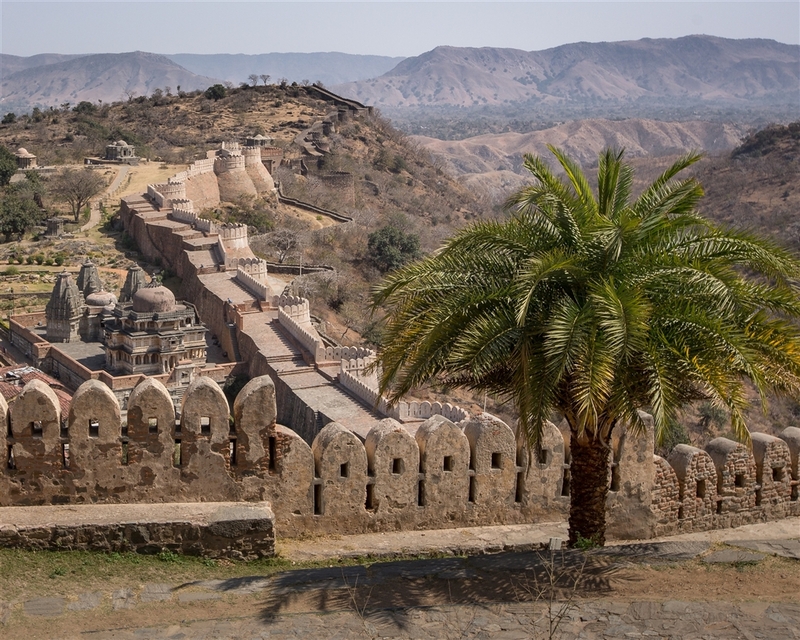 It makes for a good day trip out from Udaipur, but remember to bring a hat and plenty of water as there’s quite a lot of unshaded walking to be done if you want to explore the major monuments within the fort walls. 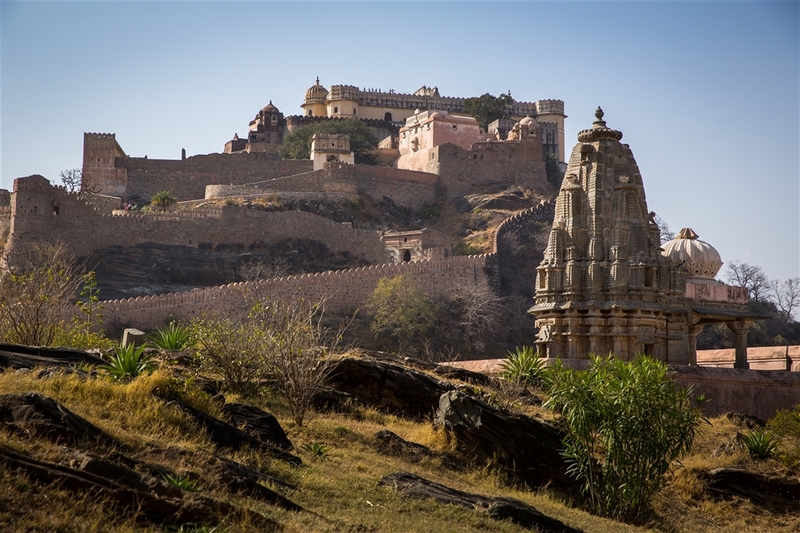 Built by the Mewar ruler Rana Kumbh in the 15th century, Kumbhalgarh gained a reputation of being impregnable, and despite sieges by armies of Malwa, Gujarat and the Mughals, it was never captured. 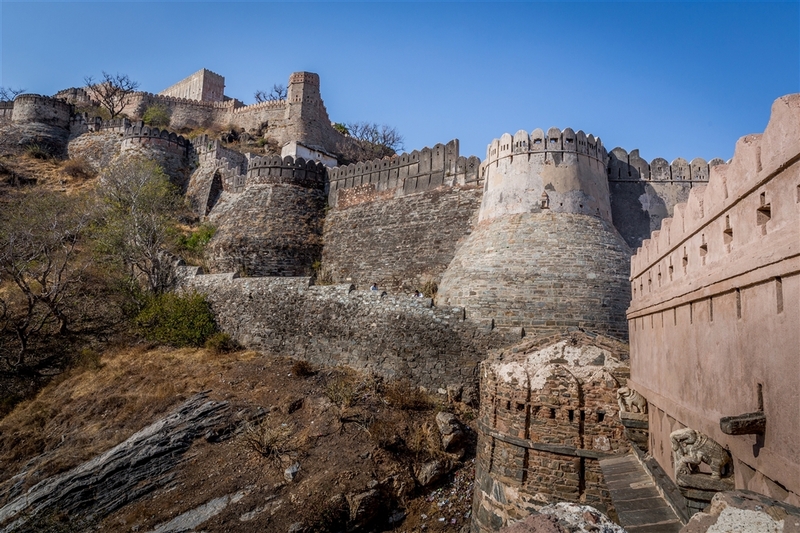 On arriving you can understand why, the walls and circular bastions that encompass the fort are massive. 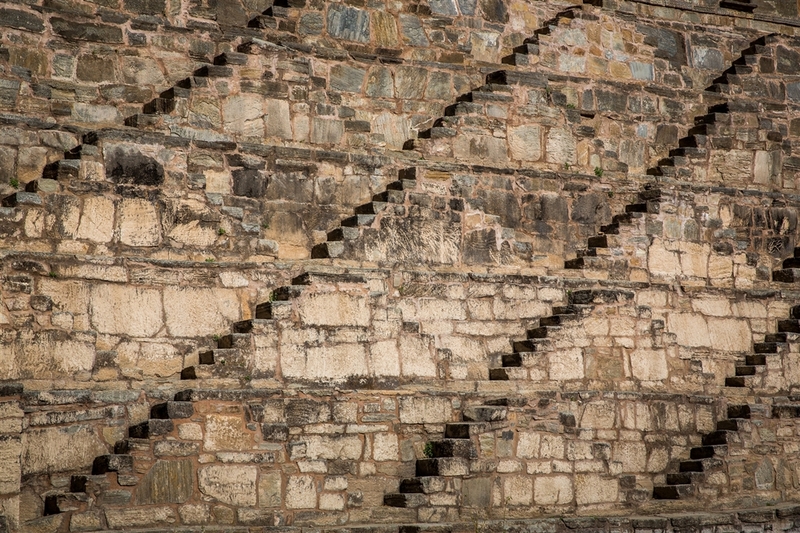 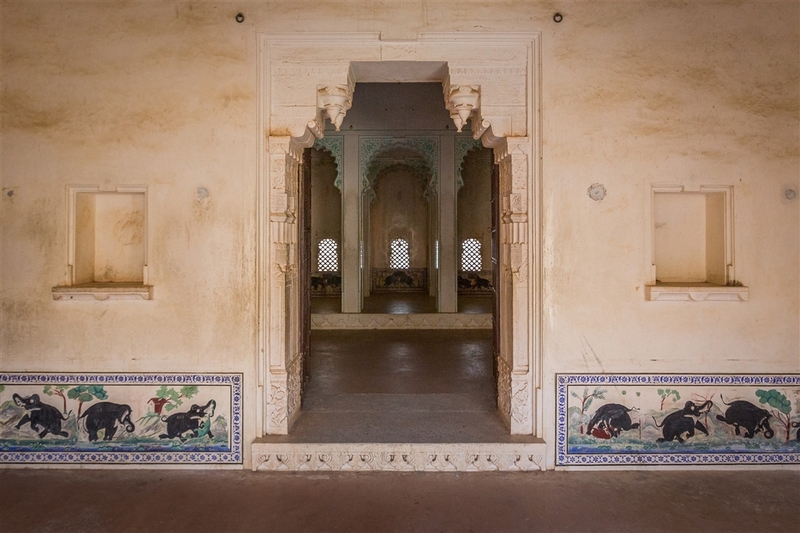 Upon entering the fort you then get to appreciate that all the more, as the walls are also extremely thick, said to be able to accommodate eight horses riding abreast. 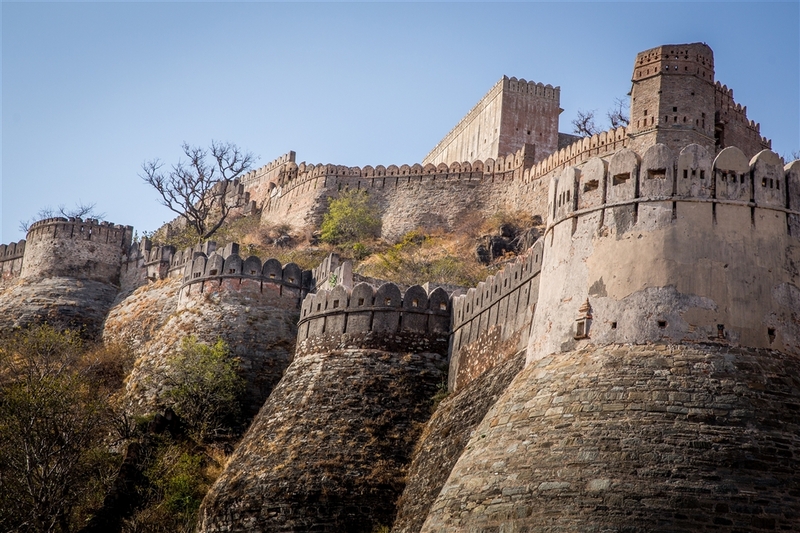 As you climb up to the main citadel and palaces, the full extent of the fort starts to become apparent. 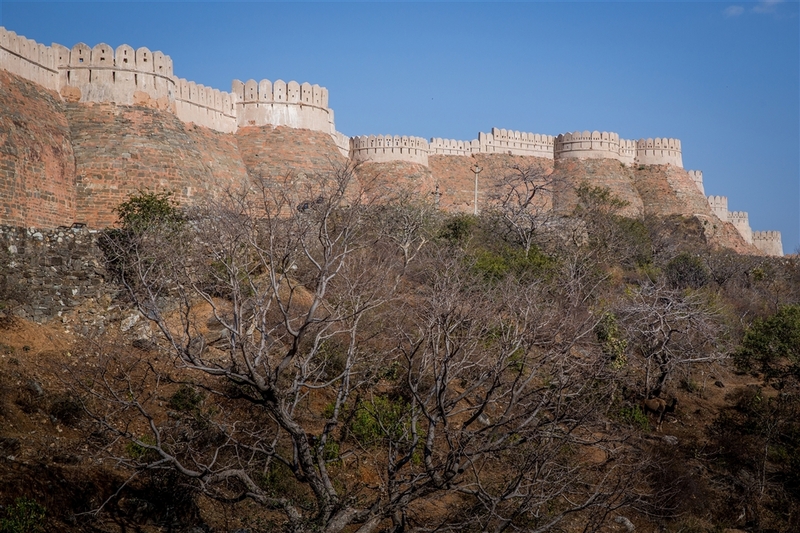 The fort wall extends for miles and miles, weaving and traversing it’s way across the landscape. 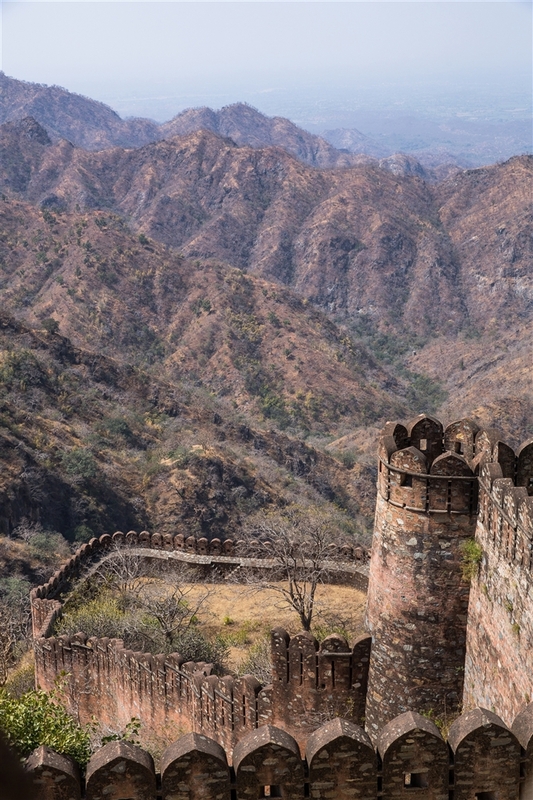 I read somewhere that the wall is the second largest continuous wall in the world, second only to the Great Wall of China and hence it is also known as the Great Wall of India. 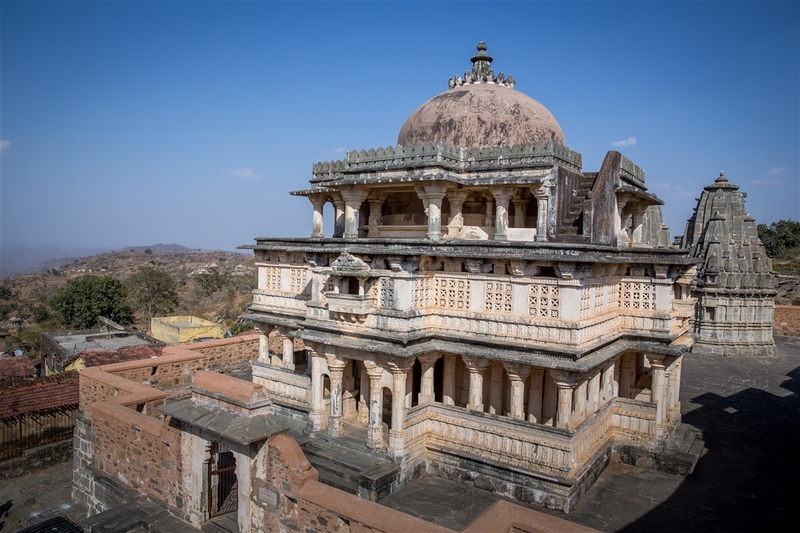 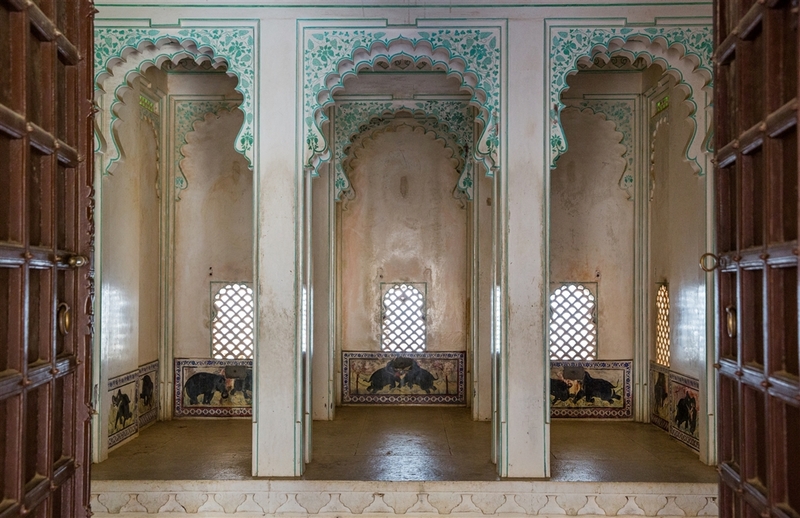 The walk up to the top of the citadel brings you to Badal Mahal, or Cloud Palace, with an inner courtyard surrounded by rooms and verandahs, painted in the 19th century with the typical Rajasthani images of elephants. 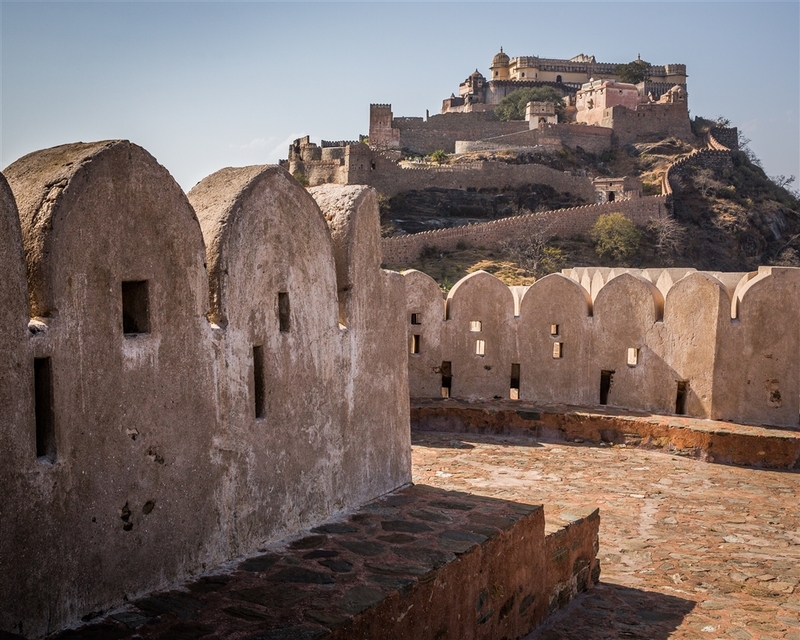 From the inner courtyard you can access stairs taking you to the roof and the best view to be had of the surrounding hills and monuments. 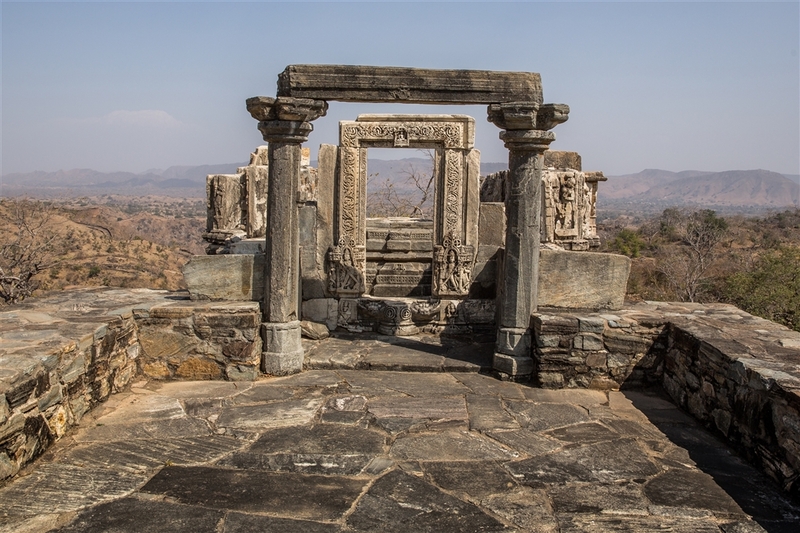 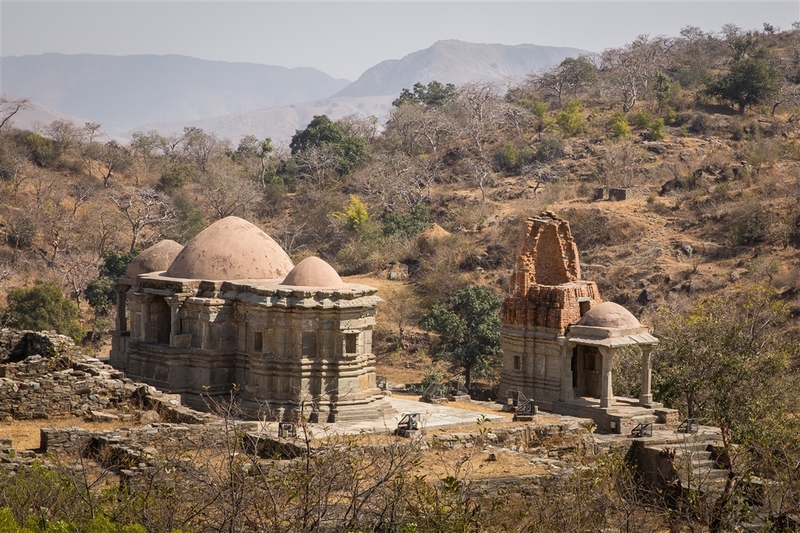 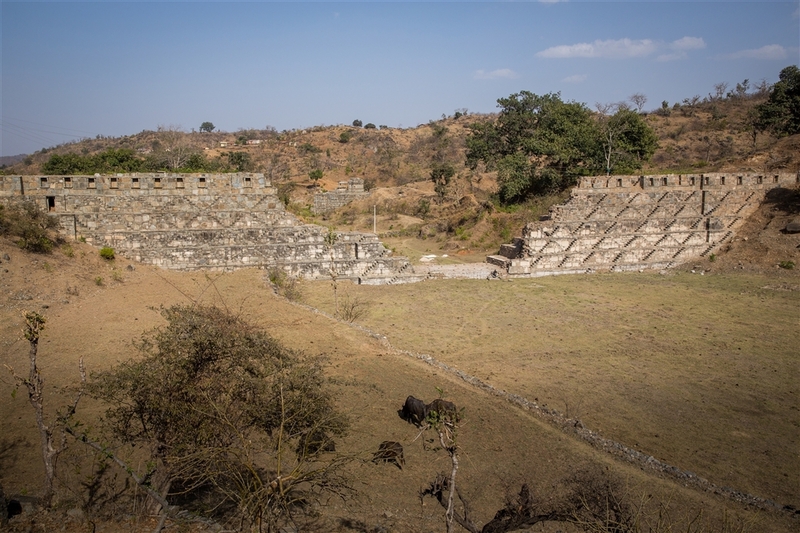 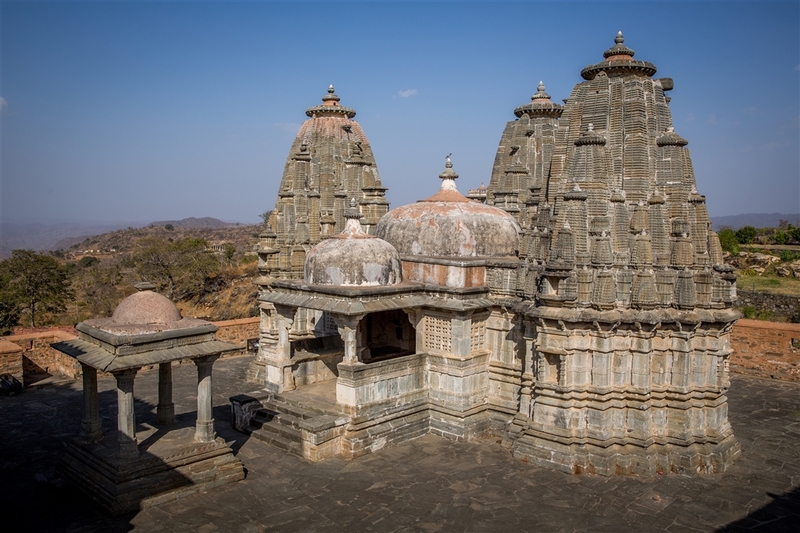 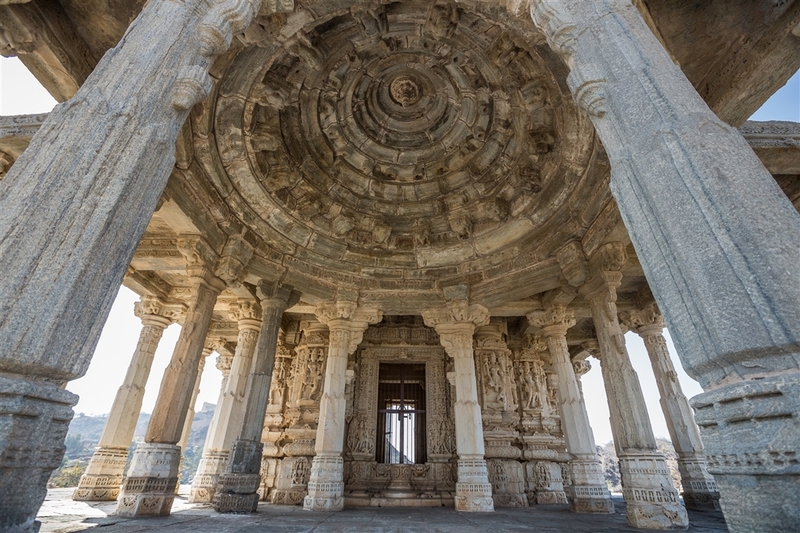 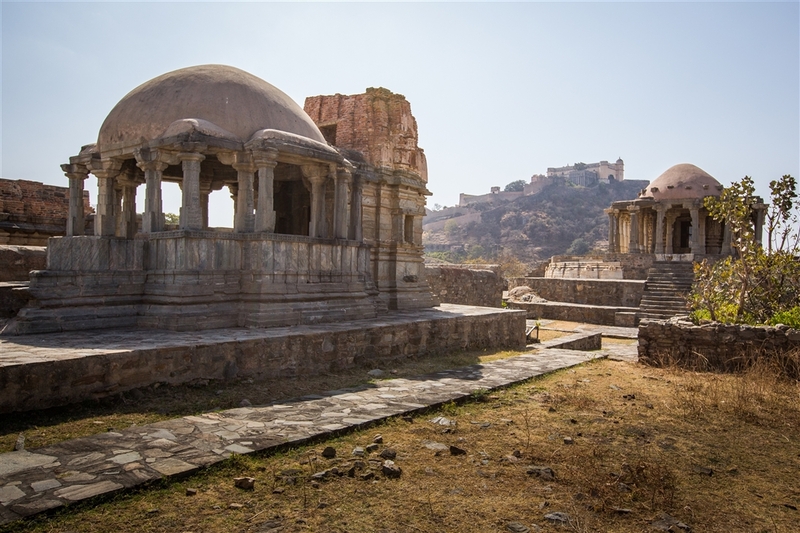 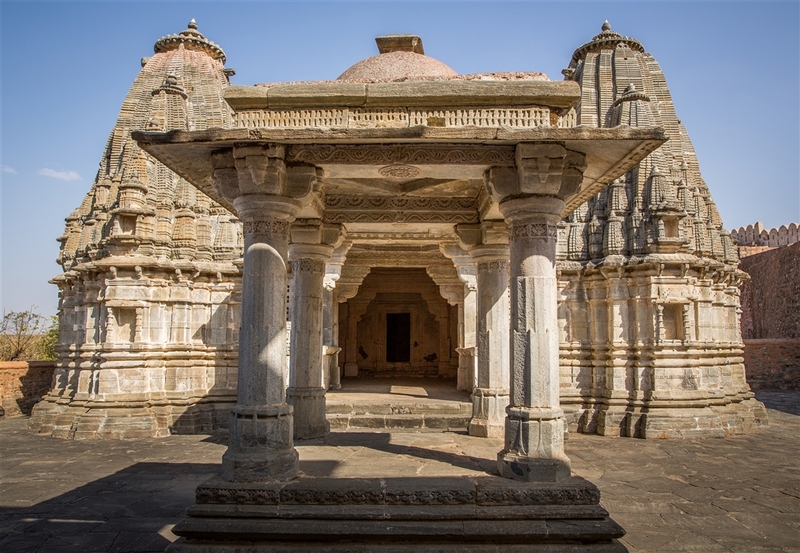 On returning down from the citadel, and continuing on beyond the entrance gate, you enter the temple complex, containing the Vedi Temple (1457), the Neelkanth Temple (dedicated to Shiva), and further on the Golerao Temples, a group of Hindu and Jain shrines. 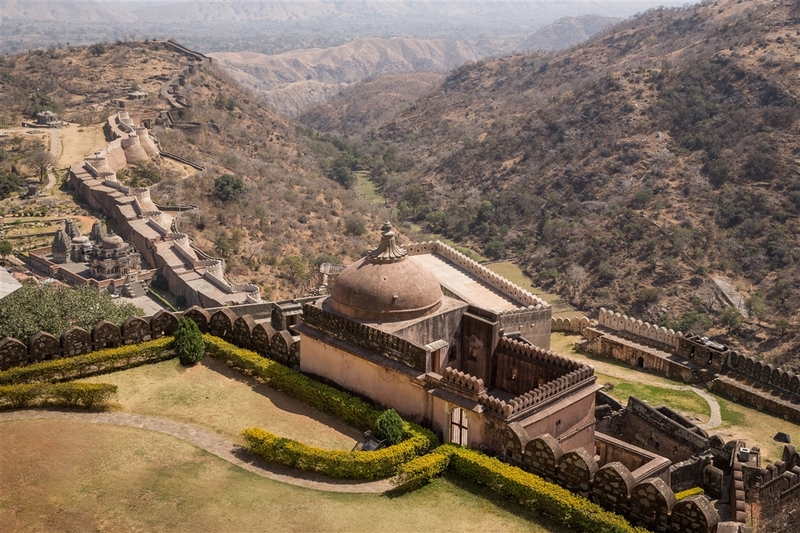 Beyond this is a path to your left that takes you around the inner perimeter of the fort, with numerous smaller temples and shrines in various states of decay, although some have been restored. 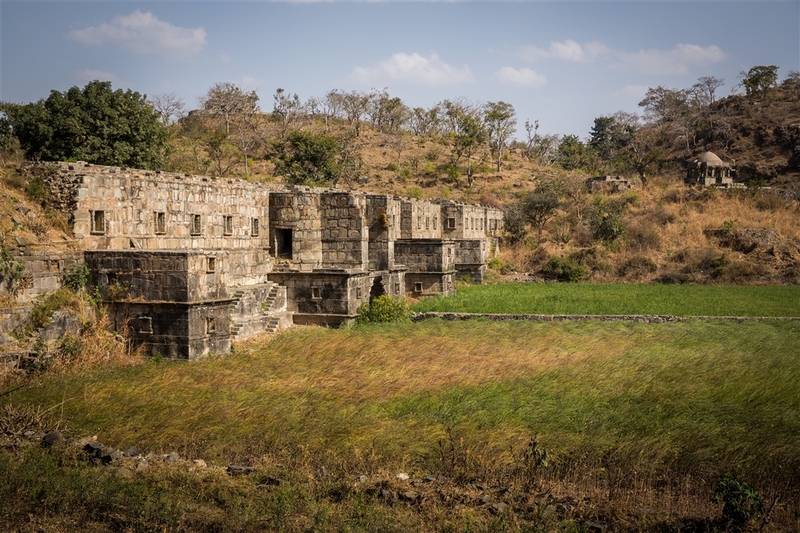 It’s been said that at one point the fort contained 365 Hindu and Jain temples, and I’d imagine the footprint of many lie just under the ground surface yet to be discovered. 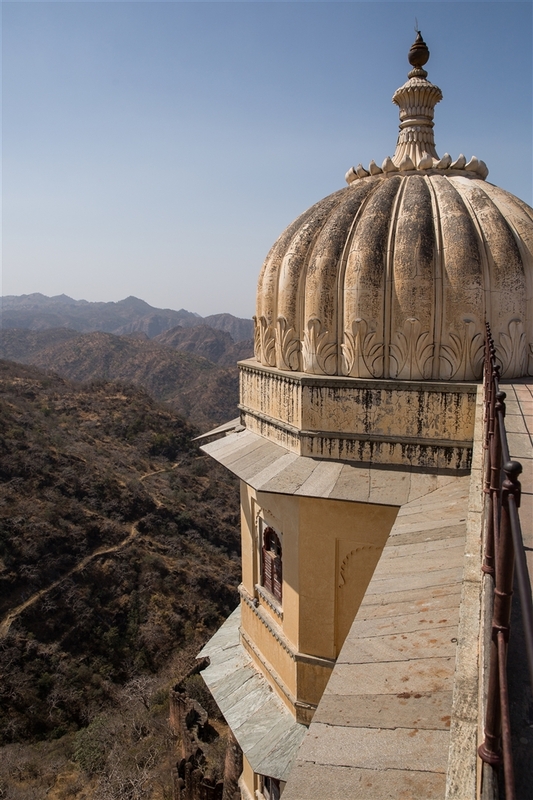 This is where you really need the hat and some water as any shade is hard to find when away from the temple structures. 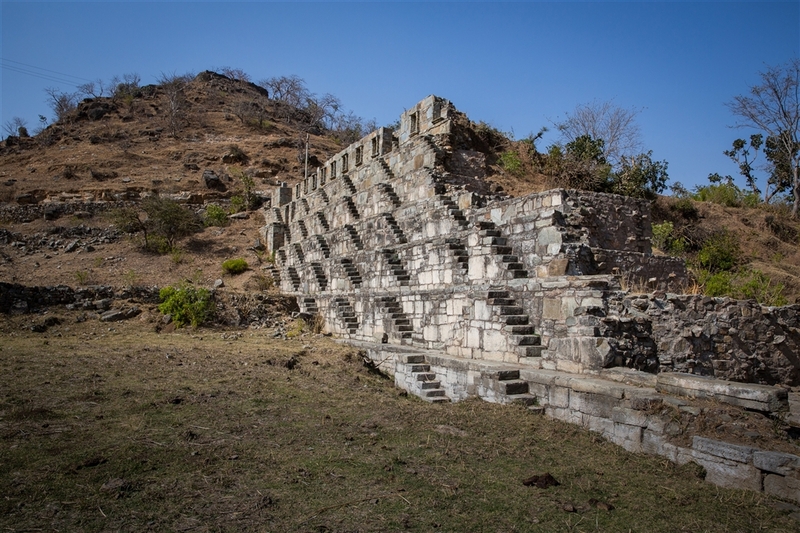 I eventually came to a ruined dam, that clearly acted as a stepped tank as well judging by the mass of steps leading down to where the waters edge once was. 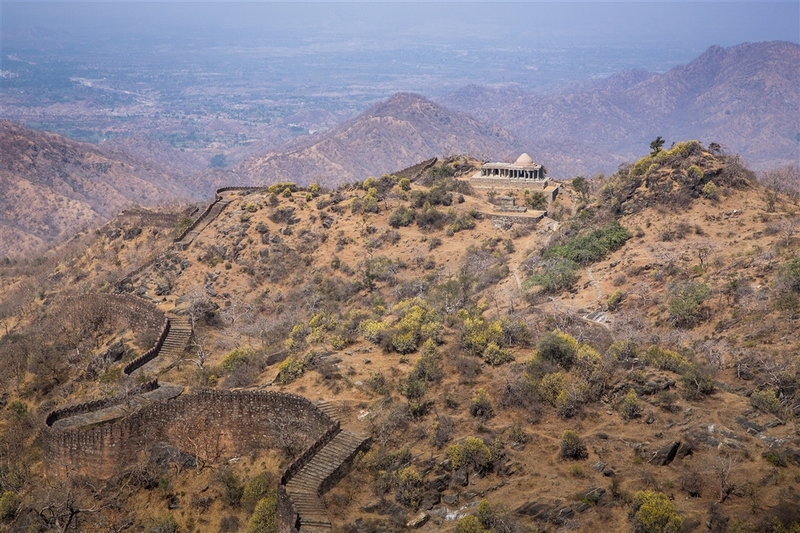 There must have been quite a sophisticated design for how to collect water high up on this hill, obviously a necessity when the fort was under long periods of siege. 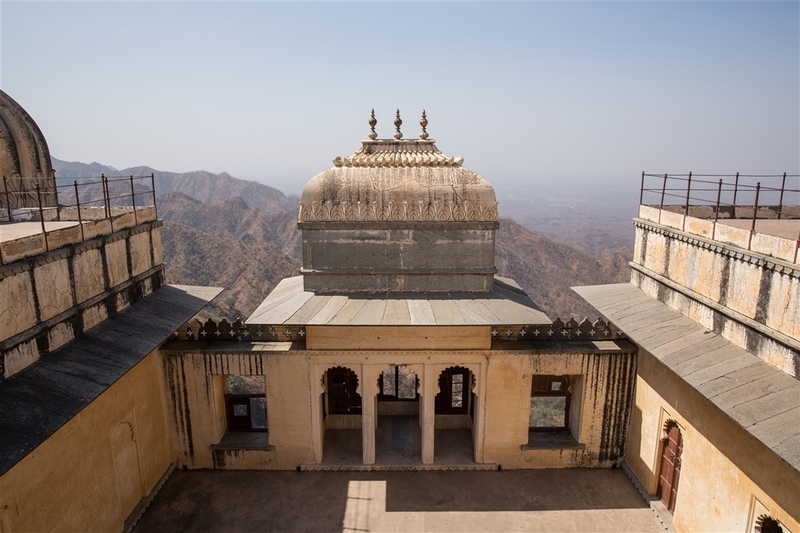 Kumbhalgarh is open daily 9am – 5pm.